FILE - Russian Deputy Foreign Minister Sergei Ryabkov. Russia will add more Americans to its “black list'' in response to new sanctions against Russians accused of election meddling. Ryabkov accused the U.S. of threatening global stability, but said that Moscow still wants to maintain a dialogue with Washington, despite being forced to take counter-measures due to "American political stubbornness," RIA reported. Thursday, the Trump administration announced sanctions on 19 Russians and five companies accused of meddling in the 2016 U.S. election. 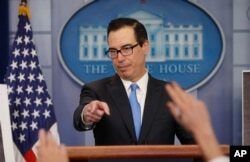 FILE - Treasury Secretary Steve Mnuchin gestures as he answers questions during a press briefing at the White House in Washington, Feb. 23, 2018. Mnuchin said sanctions announced March 15, 2018, "are a part of a broader effort to address the ongoing nefarious attacks emanating from Russia." The U.S. is also joining harsh international condemnation of Russia for a nerve agent attack in Britain blamed on Moscow. On Thursday, the U.S. government joined those of Britain, France and Germany in backing London's conclusion holding Russia responsible for the nerve agent attack. The joint statement says "there is no plausible alternative explanation" and "Russia's failure to address the legitimate request by the government of the United Kingdom further underlines Russia's responsibility." The statement was issued shortly before Washington announced the blacklisting of five entities and 19 individuals for interfering in the 2016 U.S. presidential election and other malicious cyberattacks, including on America's energy grid. "I think you can see from the actions we've taken up until this point we're going to be tough on Russia until they decide to change their behavior," White House Press Secretary Sarah Huckabee Sanders said at Thursday's regular briefing in response to a question about whether Russian President Vladimir Putin is "playing" the U.S. president. 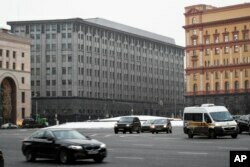 Among those targeted by the U.S. Treasury Department sanctions are two Russian intelligence agencies, the Federal Security Service (FSB) and the Main Intelligence Directorate (GRU), as well as 13 Russians already indicted by U.S. special counsel Robert Mueller in his investigation of Moscow's meddling in the 2016 presidential election. "It's more of the pressure we need to put on Russia. We've got to figure out some way to curtail their malign activities, whether it's cyber or otherwise," Republican Senator Thom Tillis of North Carolina, a member of the Armed Services and Judiciary committees, told VOA. A Democratic senator, Patrick Leahy of Vermont, who also sits on the Judiciary Committee, agreed with Tillis and said Thursday's action was "way overdue," accusing Trump administration members of going out "of their way to ignore all the attacks that Russia has made on us. Our intelligence services have been very clear. They tried to alter our elections and there is no question they'll try it again." Leahy also told VOA that the administration's response remained unsatisfactory, "but even a little bit is better than nothing." Treasury Secretary Steve Mnuchin defended the administration's response. In a statement, Mnuchin said the administration "is confronting and countering malign Russian cyberactivity, including their attempted interference in U.S. elections, destructive cyberattacks, and intrusions targeting critical infrastructure. These targeted sanctions are a part of a broader effort to address the ongoing nefarious attacks emanating from Russia." The Treasury Department's action blocks the 19 sanctioned individuals and five entities from doing any business in the U.S., while saying that Americans "are generally prohibited from engaging in transactions with them." Russian cyberattacks on critical U.S. industrial and other infrastructure are "long term and still ongoing," a national security official told reporters on Thursday. Another national security official, also speaking on condition of not being identified, singled out the FSB, saying it was targeting U.S. government cybersecurity specialists, diplomats, military and other personnel. FILE - A laptop shows part of a code, which is the component of the Petya malware computer virus, according to representatives of Ukrainian cybersecurity firm ISSP, at the firm's office in Kyiv, Ukraine, July 4, 2017. A variant, dubbed NotPetya, was used for a global cyberattack in June 2017. Treasury's statement blamed Russia for interference in the 2016 U.S. election and destructive cyberattacks, including the June 2017 NotPetya incident, which it characterized as "the most destructive and costly cyberattack in history." The U.S. said that attack disrupted global shipping, trade and the production of medicines, and prevented the creation of electronic records at several U.S. hospitals for more than a week. Trump's choice to lead the National Security Agency, the lead U.S. electronic spy agency, also expressed concern about Russia's cyberactivity during his confirmation hearing Thursday before the Senate Intelligence Committee. "Unless the calculus changes, we should expect continued issues," said Army Lieutenant General Paul Nakasone, who has also been nominated to head the U.S. military's Cyber Command. VOA's Michael Bowman on Capitol Hill and Jeff Seldin in Washington contributed to this report.